FACT CHECK: Does President Trump Have Financial Interests in Saudi Arabia? Does President Trump Have Financial Interests in Saudi Arabia? In response to Trump's tweet claiming that he has no such financial interests, social media users shared a Fox News Research tweet highlighting Trump's business dealings with the Saudis. Despite his claims to the contrary, President Trump has ongoing financial interests in Saudi Arabia. Donald Trump has had business dealings with the Saudi kingdom going back to the early 1990s, and as recently as 2017 profited from Saudis staying at his hotels. Neither Donald Trump nor the Trump Organization currently owns property or investments in Saudi Arabia. Ultimately, the Saudis acknowledged that evidence provided by Turkish investigators pointed to his being slain in a “premeditated” attack, which they said was undertaken in a “rogue operation” not authorized by the Saudi royal family. Two senior government officials were dismissed, and 18 Saudi nationals allegedly involved in the murder were arrested. President Trump was criticized in the immediate aftermath of Khashoggi’s disappearance for his apparent reluctance to hold the Saudis responsible for the incident. “We want to find out what happened,” he said. But he also maintained that the United States’ relations with the kingdom were “excellent” and he would not consider stopping arms sales to Saudi Arabia despite calls from members of Congress to do so. As recently as December 2016, Trump owned companies in Saudi Arabia, as he sought to build a hotel there. Three days after Trump’s inauguration, lobbyists working for the Saudi government funneled $270,000 directly to the Trump Organization by booking rooms at his Washington hotel. More recently, Trump’s flagging Manhattan hotel got bailed out thanks to a lucrative visit from none other than the Saudi crown prince. It raises the disturbing possibility that Saudi Arabia will get away with abduction or murder because the president is beholden to Saudi money. 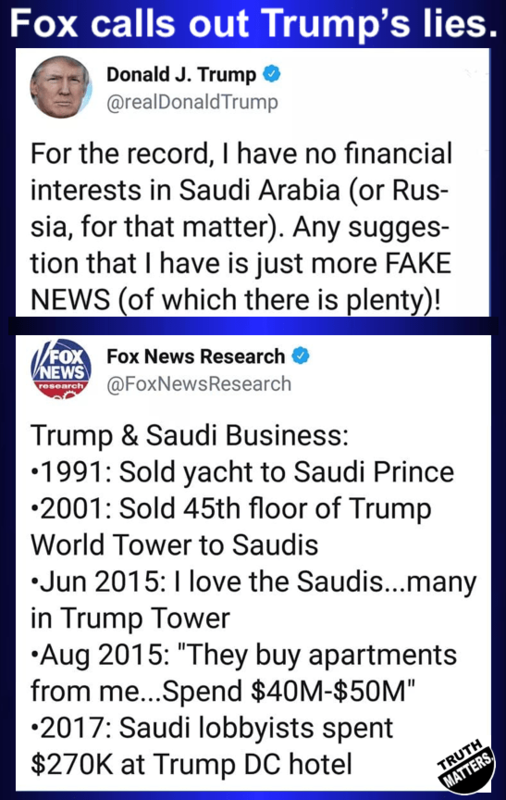 The meme presented the Fox News tweet as a refutation of Trump’s, but although each of the former’s statements can be confirmed via reliable sources, they don’t necessarily disprove President Trump’s claim that he has no financial interests in Saudi Arabia. The sticking point (and the reason we’re rating the claim a mixture of true and false) is that the term “financial interests” usually denotes the ownership of property or investments in a given place, company, or industry. We have found no evidence that either Trump or Trump Organization (the umbrella company operated by Trump’s sons, Donald Jr. and Eric), currently owns property or investments in Saudi Arabia. Fortune reported in 2017 that Trump, facing financial difficulties in 1991, sold a yacht he purchased from the Sultan of Brunei in the 1980s to Saudi Arabia’s Prince Al-Waleed bin Talal. The Wall Street Journal reported in June 2017 that Trump International Hotel Washington, D.C., received payments amounting to roughly $270,000 for services provided to lobbyists working for the Saudi government. Although Trump had announced earlier in the year that any Trump Organization profits from foreign governments would be donated to the U.S. Treasury, the company did not respond to the Journal‘s questions about what would be done with the Saudi payments, which were made through a third party. Despite his not owning businesses, properties, or investments in the Kingdom of Saudi Arabia, Trump has clearly, and by his own admission, profited to the tune of tens of millions of dollars from business dealings with the Saudis, and over a long period of time. We reached out to the Trump Organization for comment but received no reply. The Hill. 5 August 2017. Associated Press. 16 October 2018. The Washington Post. 11 October 2018. The New York Times. 17 June 2017. The Washington Post. 10 October 2018. The Wall Street Journal. 6 June 2017. The New York Times. 11 October 2018.